All are welcome at this inter-faith gathering. Held in Oren Gateway 100. The spring 2012 Sabo Center Symposium featured two Minnesota task force members in a discussion about how to spend $100 million on racial integration programs in the metro area public schools. Peter A. Swenson and Scott Thomas were the co-chairs of the task force who spoke at Augsburg's Sabo Symposium. Their discussion was moderated by educational leaders Bill Green, Augsburg professor of history who also served on the task force, and Nan Skelton, director emerita of the Center for Democracy and Citizenship. 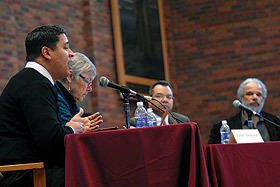 The panel discussed the trails of serving on a task force with very divided viewpoints. Swanson and Thomas said that while the task force worked together as a team, the sides were not without disagreement. Thomas, a man who identifies as mied race, explained that he is a "product of integration." His belief was that the $100 million should contribute to transportation in the form of voluntary bussing between school districts to encourage integration. Swanson, however, had other concerns. "Are we using the money that is making the problem [of segregation] worse?" he said. "If people should want to be involved with people like them, how much should the government be involved with that?" Martin Sabo '38 thanked the panelists and commended the co-chairs for their patience with opposing points of view: "The difference is that this task force started with a question, not an answer. Too many people believe they have all the answers," he said. The Sabo Symposium is co-sponsored by: the Sabo Center for Citizenship and Learning, Communication Studies, Education, Honors program, Political Science, Bonner Leaders, and the Minnesota Urban Debate League.